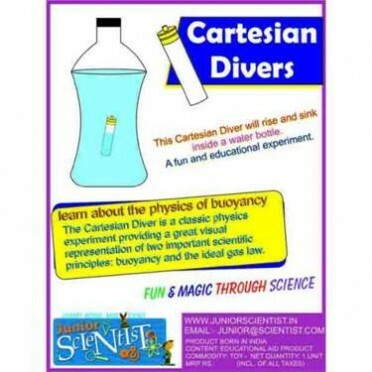 The Cartesian diver has a cap with a central tube. Initially, the diver is in the top layer of water. The diver is filled with air. We know that air also has some weight. Being it is lighter than water, the diver rests in the top layer. When we press the bottle, air in the plastic bottle is compressed. It exerts pressure on water in the bottle. Water enters the diver making the diver heavier. So the diver sinks. As you release pressure from the plastic bottle, the water from diver comes out and it becomes lighter. So it bounces back to its original position. It is a classic experiment in properties of air. It is named after the scientist, Rene De-cartes (1596-1650). We learn that air has weight, it exerts pressure and it can be compressed. This diver is also useful in understanding concept of buoyancy and even Archimedes principle. Features : Impressive, but how does it work? This experiment is all about DENSITY. When you squeeze the bottle, the air bubble in the pen cap compresses (gets smaller) and that makes it more dense than the water around it. When this happens, the pen sinks. When you stop squeezing, the bubble gets bigger again, the water is forced out of the cap, and the pen cap rises. A simple working model of a hydraulic jack system. Project is to demonstrate how hydraulics can pr.. The electric bug is a robotic insect. It normally buzzes around at random, but you might be able to.. Simply understand resistant in power supply. (AGE GROUP 12 TO 18 YEARS). SIZE APPROX : L: 10" - W:..
Based on the principle of production of dynamically induced emf,. This has two major parts-a magnet..
Do - It - Yourself Kit to Build your own Water Pump. A solar-powered pump is a pump running on elect..